Need to make an Appointment? Just ask one of our friendly experts. (800) 423-0941 Questions? Need to make an Appointment? Just ask one of our friendly experts. There is nothing more frustrating than immobility, especially in your home. For most people, full access to your personal space is a given. But if your movement is constrained by age or health demands, you know just how annoying it is to have a set of stairs keeping you from fully using your entire home. For almost two decades, Access to Freedom has helped thousands of people just like you regain the freedom to fully enjoy their entire home. Don't let your limited mobility or the anxiety of a potential fall keep you locked in half your home. 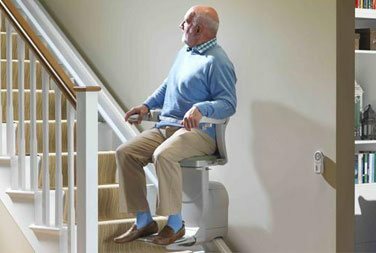 Call Access to Freedom today and find out just how easy is to have a Stannah Stairlift installed so that you can move easily and safely between floors again. There are many companies that sell stairlifts. Some are online retailers that sell low quality stairlifts directly to the consumer with no customer service or follow up while others are medical supply shops or elevator companies that try to be all things to all people. Most companies are from out of the area even though they try to fool you into thinking they are local. 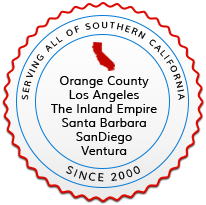 Just because a company owns a web domain that says orange county stairlifts doesn't mean they are located in Orange County. Not being truthful about where you are located is deceptive at best and if a company will lie to you about their location, who is to say they won't lie about other business aspects. At Access to Freedom we are in the stairlift business and we are located in Irvine CA as well as in Carlsbad CA. We concentrate 100% of our efforts to supplying the highest quality stairlifts available today and providing the best service in the industry. As a local family owned company we treat you just like we would want our loved ones treated. We pride ourselves on being just as attentive to your needs years after your stairlift is installed as we are when you are just inquiring. We know you value your safety or the safety of your loved one above all else so give us a call and let us see if we can earn your trust. There are few things more frustrating than immobility, especially in your home. For most people, full access to your personal space is a given. But if your movement is constrained by age or health demands, you know just how annoying it is to have a set of stairs keeping you from fully using your entire home. For over a decade, Access to Freedom has helped hundreds of folks just like you regain the freedom to fully enjoy their entire home. Don�t let your limited mobility or the anxiety of a potential fall keep you locked in half your home. 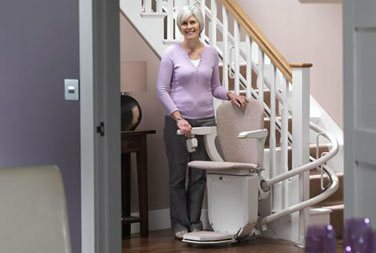 Call Access to Freedom today and find out just how easy is to have a Stannah Stairlift installed so that you can move easily and safely between floors again. There are a lot of companies that sell stairlifts. Some are online retailers that sell cheap stairlifts directly to the consumer with no customer service or follow up while others are medical supply shops or elevator companies that try to be all things to all people. At Access to Freedom we are in the stairlift business. We concentrate 100% of our efforts to supplying the highest quality stairlifts available today and providing the best service in the industry. As a local family owned company we treat you just like we would want our loved ones treated. We pride ourselves on being just as attentive to your needs years after your stairlift is installed as we are when you are just inquiring. We know you value your safety or the safety of your loved one above all else so give us a call and let us see if we can earn your trust. Access to Freedom also offers outdoor stairlifts. Whether you have a few stairs going up to your front door or a long set of stairs going down to your dock, we can help. 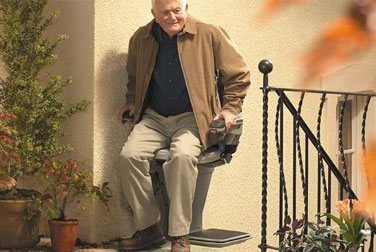 Our outdoor stairlifts are designed for the outdoors. These units are not indoor units with a plastic cover, they have been designed to handle the toughest weather. From plastic weatherproof upholstery to weather-tight fittings and specially coated circuit boards, these lifts will handle the elements. "I wanted to say thank you and tell you how much I appreciate all the extra you go through to get a job well done and to make a customer happy! Your guys are very friendly and professional and they did a fantastic job." response on our new stair lift. that you had a unit in stock, it saved our life! "Just a note to thank you for your kind consideration. Your installers were really great and left everything cleaned up which I really appreciated." "We recently purchased a stairlift from Access to Freedom. I reviewed stairlifts and believe Stannah to be the best. Rick answered all our questions and made it easy to make our decision. The installation was fast and easy and I highly recommend this company to anyone looking for a Stairlift." 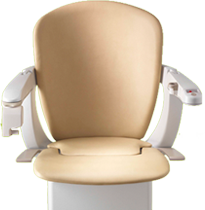 Access to Freedom specializes in curved rail stairlifts from Stannah stairlifts. Stannah by far is the finest curved rail lift available today. Our curved rail stairlifts have stylish rails made of two steel tubes that bend around almost any corner and can be designed in almost any configuration. compared to the big obtrusive rails of other units. Stannah Stairlifts are thoughtfully designed to be versatile - they go around corners and double bends, adapting to any staircase, narrow or wide. Stannah Stairlifts work even during a power outage thanks to reliable battery power with automatic recharging. 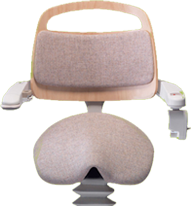 Stannah Stairlifts fold neatly out of the way when not in use. All the indoor models can fold without bending over - an important safety concern at the top of the stairs. Stannah Stairlifts come in a variety of styles and a range of colors to suit your home's existing decor and ensure that it blends in with your style. Every Stannah Stairlift is installed by courteous, professional installers who will verify and test the stairlift and teach you how to use it. 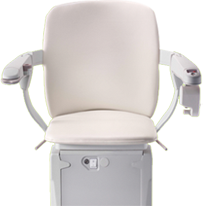 Stannah Stairlifts are guaranteed to uphold Stannah values of quality, reliability, and safety. Contemporary design, with a host of innovative features for straight and curved stairs. Fresh, contemporary styling with the best in stairlift engineering. The simple contours along with five classic color options make the Siena a smart and practical addition to any home. Designed specifically for people with limited flexibility, the Stannah Sadler is a totally new concept in stairlift design. Access to Freedom is proud to offer a unique rental program for our straight stairlifts that no other stairlift dealer in Southern California is offering.